It’s time for a new feature on esposavida.com : 5 under 50, where I’ll showcase 5 pieces under £50. First up- handbags! Topshop mink colour satchel- perfect for work, classy and functional, but still cute. A real winner in my book! I love that satchels have come back in to fashion! Teal DSW crossbody bag- so cute for a shopping trip, just the perfect size and I love the colour! Pink Victoria’s Secret beach bag- gorgeous bright colour, just what you need for trips to the beach this summer! You don’t even have to worry about sun cream spillages! Silver glitter clutch from 6pm- I just adore this- so fun! An amazing addition to any outfit, everybody needs a little bit of sparkle in their lives! Teal and pink accessorize tote- It absolutely helps that this tote is in my two favourite colours! It’s a great size and the geometric chevron print and tassle make it so fun and eyecatching- perfect for festivals! 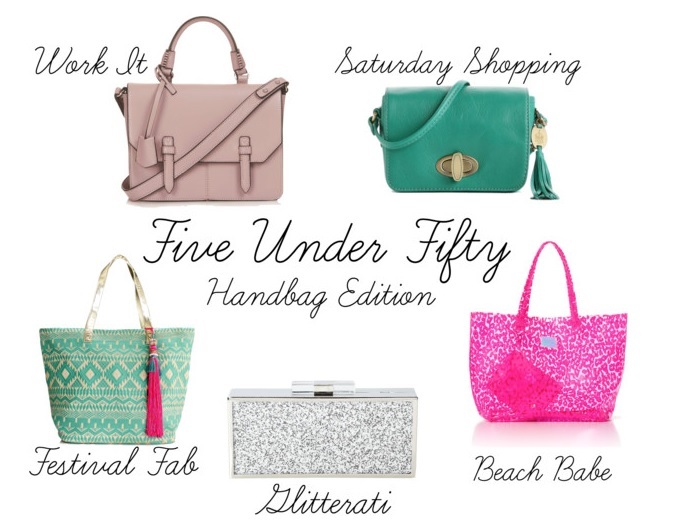 Which bag is your favourite from these?